limeyangler had the most liked content! Which Gopro did you get? Hey Brian, I only started cooking and cleaning them last year really. I had eaten it before that when other folks had prepared it, but was put off keeping them because I thought the cleaning process sounded beyond my capabilities and span of attention...lol. I watched a couple of Youtube videos and thought it looked pretty simple, and it is! The only thing you have to make sure of before you clean them is that the fish is not frozen solid and your knife is razor sharp, other than that you need a pair of pliers to peel them like a banana, if you manage not to go right through the meat when making the cut for the skin after peeling there are three easy steps for three cuts of meat, no more time to prepare than say a Laker or Pike and surprisingly less messy than you would think. I'll try and do a cleaning video soon, but here is a culinary experiment my sidekick and I did last year. Yeah, it was a hoot, going back today, ice is still good for at least a week. Hi all, Have been meaning to do this for a couple years now but never got round to it. Basically the Ling spawn this time of year and stack up. Finally made it out with a 2 hour window of opportunity before work. I thought you had to fish them at night but a buddy said they hit during the day at this time of year. He was not wrong, could not get a line down fast enough for the whole time I was there. I wanted to leave after an hour but it was so fun i stayed for 2. Lots of ice left so i think I will have to do that again before they finish their spawn and go when I have more time so I can chase lakers too. Hi all, believe it or not I was working. 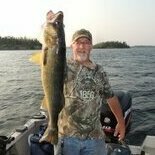 Hi all, Got out for a few hours on Wabigoon Lake and Eagle Lake for Crappie and walleye, dog got a walk out of the deal too. Hi all, Still lots of ice here, and the bite is starting to warm up. Got a limit of slabs in under an hour, its called 'catching' and not 'fishing' when the bite is on. Hi all, got a message on another forum from a guy coming up to Dryden for a couple of days asking about crappie fishing. he was originally from dryden and was meeting a dryden guy here. I unexpectedly got the day off and was not working the next day anyway so we headed out together for two short evening sessions on the goon. Fish were caught, fun was had and new friends made. Hi all, Had a couple hours to spare after work so took the dog for a walk. We headed down to Eagle lake and set up on a popular spot. The bite was pretty much on for the whole hour or so before it started getting dark. Roloff has not been fishing with me for a while as he is getting on a bit now and has difficulty with long treks in the snow, so a trip to the bridge now it is warmer was right up his alley! Had a few hours to kill yesterday afternoon so took off locally for crappie and walleye. The crappie were small, looks like the 'famous' spot next to the ice road is getting fished out. I then headed down the skidoo trails for some walleye. Mission was a success! YEAH, MISSION IMPOSSIBLE! Lucky for me maybe. I know, its a crazy small world these days. I could not believe the camera was rolling for that one....lol. Look out PEWDIEPIE! Dang! The next one I want to catch on film is a pike hitting the transducer, has happen 3 times this year. Really bizarre, and yeah to have it on video is awesome. You know what, I've not dropped much through the ice, but i'm into $1000's from the boat. I did get my flu shot, i just said flu to describe a heinous illness, kind of like saying bandaid or kleenex to describe all bandages and tissue paper. Crazy huh? That never happens and to get it on film. I kind of have to get it, our workplace has a policy where if you don't and get flu your sick coverage is void. Thanks Chris, I'm not to worried about the replies...lol...after all it took me a week to reply to this! That would have been cool. The random guy and woman in the video were actually a couple from way up in Northern Manitoba. The guy Chris contacted me via Youtube in the summer and we met up a couple of times while there, we plan to exchange summer trips in Dryden and Cranberry Portage in the years to come. I had a heavy heart leaving this year as most years, have made some good friends locally, the fishing is always an adventure and its great to see my mum and dad. Definitely FUN! No fish in these waters can compare pound for pound power. The rush of adrenaline when you get bit is actually physically exhausting! Never know what is going to end up on your line. You're welcome. To be honest 'Hammering' fish there is not easy. I have locals and requests from all over the world asking where i'm fishing...lol....I have never been snobby or particularly protective of places i fish back home but I am very selective on sharing spots on the island, and you have to sign a non disclosure agreement if I do(jk)! I agreed to share spots with Chris from Manitoba was because he is a Wildlife Biologist and specializes in wetland conservation, something that the Antiguan government needs to do if there is going to be any fish left there at all. The Island is EXTREMELY developed and getting worse, the mangroves where I caught the big snapper in my previous video are being stripped as I type to make room for ugly shopping malls and condos, no more breeding grounds equals no more fish, whole eco systems are collapsing. SAD. If you do head back there I'll get you a few spots to try. Thanks Scuro, Been practising a while now:). Its not actually a 'travel rod' per se, its a 2 piece, 7' St.croix, Heavy. Very good rod combined with a Stradic HG 4000 series. Might go up to the 5000 series to avoid being spooled again, lol. LOL, tell me about it, I was just waiting for it to pop off the hook, I was using weedless swimbait hooks which are great but getting the hooks into a fish I find is 50/50.